WARREN FRANCIS SNOW (1869-1962) was a well-respected American painter and teacher known primarily for his bucolic, oil-on-canvas landscapes featuring backcountry settings and wintry New England vistas, as well as his colorful and accomplished pieces executed in later life on the island of Bermuda. Snow was born on November 4, 1869 in Brewster, Massachusetts, the son of Zoeth and Rebecca Snow. Census records indicate that his father was a blacksmith and a farmer, and that in early adulthood the future artist found work as an undertaker. Indeed, it is believed that Snow did not begin to paint in earnest until around the age of twenty-six. From 1900 to 1910 Snow maintained a studio in Cohasset, Massachusetts, and later, in 1930, worked out of a studio in Meredith, New Hampshire. The following year (1931), he made his initial sojourn to Bermuda, where his visitations soon became frequent and prolonged, ultimately resulting in the island’s newspaper of record referring to him as a “local resident” (Royal Gazette, October 27, 1941). Snow’s relationship with Bermuda eventually evolved into a close and mutually beneficial one; in the February 24, 1948 edition of the Royal Gazette (on the occasion of an exhibition of Snow’s paintings at the Bermuda Art Association), the paper quoted local politician and businessman Sir Stanley Spurling as positing that “(Snow) had done more to advertise Bermuda in the United States through his pictures than any other artist.” Snow had also exhibited at the 1933 and 1934 Art Association shows, as well as in the wartime (1941) United Arts Festival Show. At least one of his paintings was a raffle-prize at the St. George Hotel in 1937, while in 1946 he was “well represented” (Ibid, April 11, 1946) at the newly re-formed Art Association’s “Art Week” exhibition at the former Hamilton Hotel. Several of his pictures were displayed at the Association’s Annual Exhibition of 1947, and at the Sandy’s Flower Show at “Cambridge” in Somerset later that same year, where one of his paintings, Old House, was awarded 3rd Prize in a popular-vote competition. He also participated in the Association’s 1950 Annual, and held a solo show shortly afterwards at the Association’s new “Gunpowder Cavern” Museum and Gallery in St. George’s. While in Bermuda, Snow refined his work in a studio at the base of Lighthouse Hill, Southampton, and in 1948 purchased a six-acre waterfront property at Perinchief's Bay. (According to the February 23, 1948 edition of the Royal Gazette, as referenced by Jonathan L. Evans in his book, Bermuda in Painted Representation, Snow listed his middle name on the application to purchase the property as Freeman,the only known instance in the historical record of an alternative middle name.) By the 1950s Snow had turned a considerable amount of his attention toward teaching, but continued to paint in Bermuda until at least 1959, and seemingly always in oils. Some notable examples of Snow’s work in Bermuda include Grape Bay, South Shore, Bermuda; Bermudan Gardens; A Bermuda Shoreline; and Jail Lane, SW Severges, Bermuda, the last-mentioned effort featuring a palette almost Fauvist in its coloration. Though his paintings were generally small (sometimes miniatures), he also produced substantial panoramas, such asBermuda,1936, believed to have been commissioned by a detachment of the Sherwood Foresters Regiment, a line infantry regiment of the British Army stationed in Bermuda (on garrison duty) at that time. 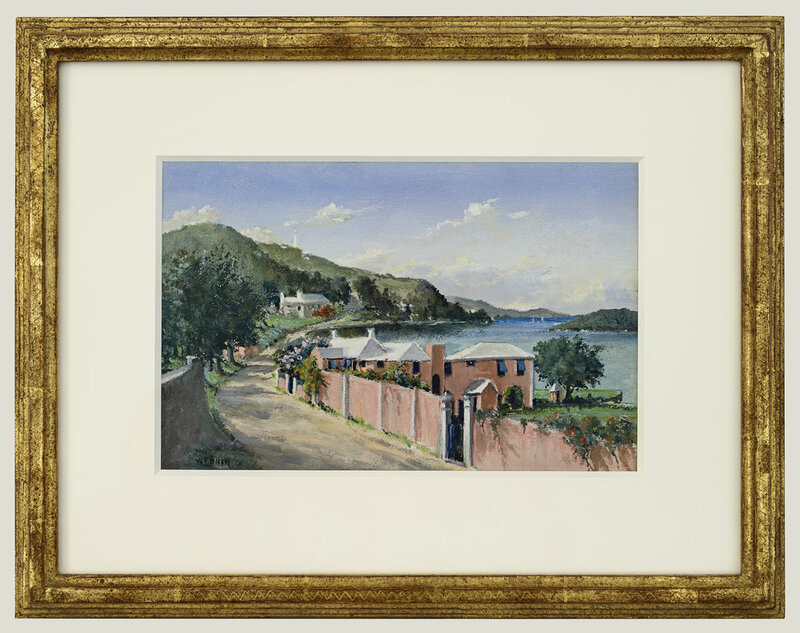 The painting, whose vantage point was Prospect Camp and encompassed Hamilton, Government House, and the distant Dockyard, foreshadowed the more Impressionist character of his later works. Quite similar in feel is Snow’s large, 1940 painting Mullet Bay, St. George’s. Several of his more commercially-inclined works were reproduced as prints and sold at the Yankee Store. In addition to his aforementioned bases in Massachusetts and New Hampshire, Snow is known to have traveled and painted extensively on the American mainland, including stays in California and South Carolina; his oeuvre also includes work produced on the island of St. Croix (the U.S. Virgin Islands). A few significant examples of his domestic output are Country Road in Autumn(1954); Mount Chocurua, New Hampshire (1945); Sand Dunes and Crashing Waves (1946); St. Croix/A Virgin Islands View (1941); New England Homestead; Landscape; and The Mirror, Magnolia Gardens, Charleston (creation dates of the final three paintings remain uncertain). In 1952, a painting by Snow of the historic Waterlot Inn in Bermuda, as well as a representative sampling of his work, was part of a prestigious private collection put up for public view in an exhibition at the Whistler House Museum in Lowell, Massachusetts, once the birthplace of the famed American painter and etcher, James McNeil Whistler.